The little one is almost here! No, seriously. I swear he's coming. Soon. I'm a little freaked out. I'm a little bit nervous. I'm a whole lot of excited. 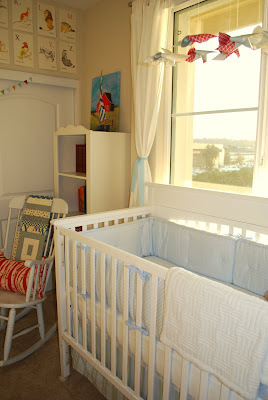 So, here's the nursery which I "officially" can say is finished now. Yes, it's not perfect but that's because I really wanted to paint a lovely trellis wall (like this) and I really wanted a dresser/changing table that matched the rest of the furniture and I really wanted a whole slew of expensive, pretty things like a new rocker. Whatever though - I kind of like that it's not perfect. 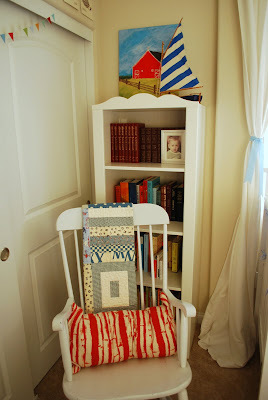 Here is: the reading corner. The rocking chair is not comfortable for chapter books or anything that can occupy long bouts of sitting (i.e. nursing, cuddling) but I love it all the same. I have the beginnings of a tremendous book collection and that thrills me to no end. Here is: the alphabet wall that I posted about before but with new and improved pixel strength! The little paint swatch banner I made is one of my favorite details. Here is: the bedding that I got for next to nothing on Pottery Barn Kids clearance. The skirt is cute too though I didn't take a close-up. One of the biggest struggles was finding the space in our 10' x 10' guest room for a double size bed, a dresser/changing table, a bookcase, a rocker, a crib and a nightstand. David and I went around and around hashing over how on earth we would fit it all. Somehow we made it work without it feeling too cramped. 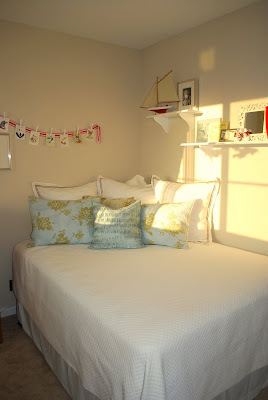 I was inspired by several of Oh Dee Doh's examples of creating a guest room/nursery. I'll admit I was skeptical at first but now I think it's going to work out mighty fine. There's even space on the floor for a teeny, tiny baby to play with his toys. Perfection. 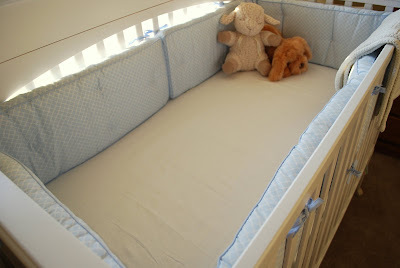 your nursery is beyond darling. and when you posted about the paint swatch bunting before i was quite inspired by it and made my own halloween version. i'm kind of obsessed with the idea now. so thanks! you'll LOVE having that bed in there. that's one thing i miss about sharing a room with hallie. i would lay her on me and sing her songs when it was bedtime. it was pure sweetness. it's beautiful and perfect and that little boy is so lucky! nice work! It's not dirt cheap, but it's reasonable. And comfortable. That's our plan for the nursery. I LOVE your nursery. It really is perfect. And kudos to you for discovering the brilliance of PBK's new bumpers. Now you won't have to straighten them out every two seconds like with the flimsy ones. It's darling Liz! I am so impressed that you got everything done. Can you come over and do mine now? This nursery is SO cute!!! Oh I think it's just lovely! You've definitely worked with the space well and I love all the little details. Can I come stay in that bed? Everything is so sweet. I, too, was enamored by your little paint swatch bunting. The halloween idea from Abby is a great one. I guess I better get on it! I have to go paint shopping anyway. It turned out perfect! 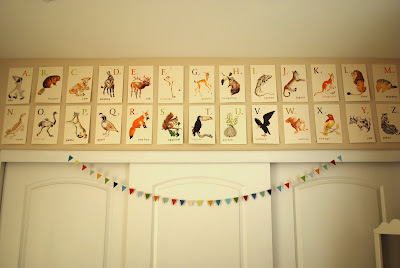 I LOVE the alphabet wall. Sooo adorable. YAY its all ready for when you lil guy makes his grand appearance. Lizzy, the whole room is charming. Very bright and beautiful. Right out of a magazine! Can't wait to see pics of the baby soon. A few more weeks right? So excited for you guys. 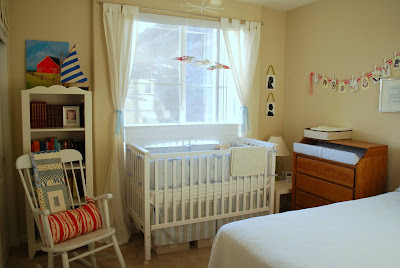 Just wanted to say the nursery is adorable! Hope you are feeling well. I have been following your posts as I am due with our first girl 1 day before your due date. Hope you are feeling well. I know I am sure ready at this point. Best of luck to you and David and I will be looking forward to baby updates as we get closer! its beautiful enjoy every minute.